For many women going through menopause, memory lapses can be one of the most unsettling symptoms. This can lead to many misconceptions, such as the belief memory lapses are indicative of a more serious issue. Memory lapses, however, are typically due to hormone fluctuations that occur during menopause and are rarely a cause for concern. Learn more about what memory lapses are, what causes them, and the treatment options available. Memory is defined as the mental capacity or faculty of retaining or recalling facts, events, impressions, or previous experiences. Memory lapses, then, are fleeting periods when a person loses the mental capacity or faculty of retaining or recalling information. Two types of memory are affected in women who experience memory lapses: short-term memory and recent memory. Women who suffer from memory lapses typically report that they have "brain fog" when trying to remember where they left their reading glasses, for example. Recollections of names, dates, and addresses can also elude a woman experiencing memory lapses during menopause, especially when she just received that information. Memory is often simplified into only two categories: short- and long-term memory. In fact, there are several types that comprise the extremely complex function of memory. The different types of memory shown below will give a better idea of the different functions memory serves. The ability to remember information for brief moments, such as a telephone number for the time it takes to dial it. The ability to recall day-to-day events, involved in learning new information. The ability to recognize smells, sounds, and sights. Also known as remote memory, long-term memory deals with the more distant past. The ability to remember the meaning of words, facts, and a generalized knowledge of the world. The ability to remember motor skills - knowing how to do things - such as how to walk, ride a bike, and eat. The primary symptom of memory lapses is the inability to recall information at will, but there are other secondary symptoms of memory lapses as well. Once a woman is able to recognize that she is having memory lapses, it can be extremely useful to learn about how and why they happen. Click on the following link to learn more about memory lapses, or continue reading on to learn more about the various causes of this symptom. While many people believe that dementia is the same as age-related memory loss, in reality, they are actually two different issues. Age-related memory loss may be frustrating, but it does not impair a person's ability to interact with others and live independently in the way that dementia does. There are several different types of memory loss and confusion, and many of them are manageable so that they make little to no impact on your daily life. In many cases, managing the underlying cause is key to treating confusion and memory loss, especially in older women. Several factors can be the reason behind memory lapses in menopausal women. 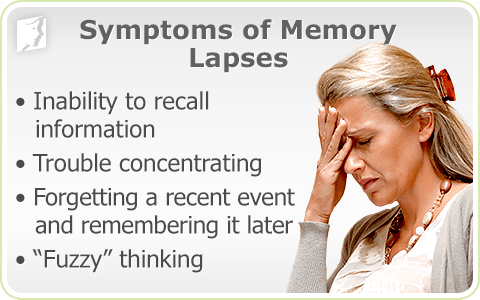 Like many other menopause symptoms, memory lapses are caused largely by hormonal imbalance. Memory lapses can also be a compound of other menopause symptoms that affect a woman's concentration level and mental retention. Memory lapses are a common occurrence for women experiencing perimenopause. As a woman approaches menopause, levels of certain hormones in the body decrease. These diminishing levels, particularly of estrogen, have myriad effects on a woman's body and mind. 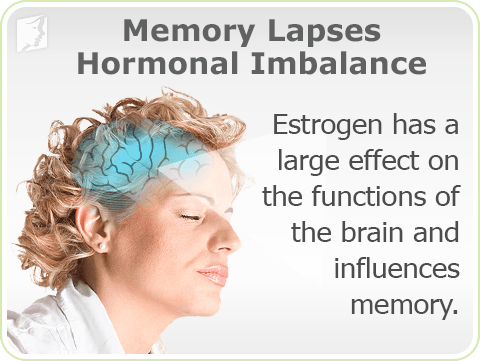 In the case of memory lapses, estrogen plays a special key role. It has a large effect on the functions of the brain and influences language skills, mood, attention, and a number of other functions, including memory. Estrogen is directly linked to verbal word fluency, or the ability to remember names and words. It's no wonder, then, that as a woman's estrogen levels begin to drop, her memory may suffer. Fortunately, at whatever level a woman is experiencing memory lapses, there are solutions. 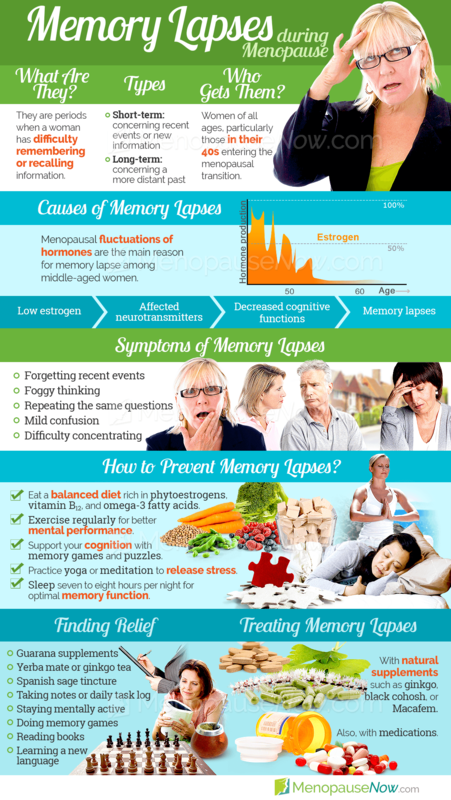 Click on the following link to learn more about the causes of memory lapses during menopause, or continue reading below to learn more about the treatment options. Memory loss can be caused by a variety of health conditions, with diabetes usually not being listed as one of them. Discover more about each of the two conditions as well as the relationship between diabetes and memory loss here. While slight memory problems are a normal part of the aging process - things such as losing small objects in your home or forgetting a new friend's name - more significant memory issues are not normal, and the cause behind these issues should be investigated to rule out more serious problems. Fortunately, most of the time, memory lapses are not a condition that a woman must live with permanently; treatments are available. It is recommended to begin with the least invasive method and progress up to more drastic treatments if the symptom remains unaffected. Modifications in habit can be implemented into a woman's life, such as dietary adjustments or a different exercise program. A balanced diet including additions such as omega-3 fatty acids can help a woman to concentrate. In addition, a wide variety of fresh fruit and vegetables is important in order to obtain memory-boosting antioxidants and the vitamins B, C, D and E, all of which are important for proper mental function. Mental exercises and games, such as crossword puzzles and Sudoku, have been shown to improve memory. Exercise and proper sleep also go a long way in helping with memory. As the primary cause of memory lapses in menopausal women is a decrease in estrogen levels, generally the best way to manage this symptom is to address the fundamental hormonal imbalance. Natural supplements can be a safe and effective treatment option. There is a third option if the recommended combination of lifestyle changes and natural remedies is not effective enough. Pharmaceutical options to treat memory lapses exist, though these carry a higher risk of side effects. If memory lapses are so severe that a woman is considering these options, she should consult a trusted medical professional to better understand the potential benefits and risks involved. Click on the following link to learn more specifics about the treatments for memory lapses, which begin with lifestyle changes, move onto alternative medicines, and finally, if those options do not work, medications. Studies have found a correlation between higher levels of education and better brain functioning and memory abilities in old age. Although nobody is sure exactly why this correlation appears, it suggests that exercising your brain with new knowledge might be one of the most effective ways to prevent memory loss. Should I Take Medications for Memory Loss? Sometimes, memory loss can be caused by something as simple as stress or a lack of sleep. In fact, a condition called psychogenic amnesia - in which a person may forget their own identity - can result from an overabundance of stress. This condition tends to resolve on its own. 10/17/2017 Memory loss can be due to a number of different causes and may present itself a number of different ways. Additionally, contrary to popular belief, there are actually some fairly common forms of memory loss that can be resolved completely with the right type of treatment. 01/16/2017 After menopause, a woman enters a phase known as postmenopause. It's natural to assume that upon entering this phase the symptoms that may have plagued perimenopause, like memory lapses, will diminish. Due to various environmental and biological factors, however, this may not be the case - but memory lapses are not always cause for concern. Should I Read More to Prevent Memory Loss? 07/20/2016 Menopausal memory loss is a symptom that's best prevented and combated with brain-stimulating activities. Activities that require prolonged engagement and concentration will strengthen the cognitive functions and improve short-term memory. Reading more can be a challenge, due to the nature of memory loss, but it is a great way to do this. 07/11/2016 The memory loss episodes known as brain fogs that occur during menopause are primarily caused by hormonal imbalances, but your lifestyle can trigger or worsen memory issues, too. Many women are unaware of how their diet and other habits might affect the way their brain processes, stores, and retrieves information.